Samuel Farrand is a international digital artist and graphic designer raised and currently residing in NH. He has always enjoyed art ever since he was young. One of his favorite past times as a young artist was expressing his imagination through various mediums. His first body of work was created around the age of 6 or 7 years and was a comic book series that hinted at culture and history something to this day that is still an important component in his artwork. He started exploring the digital medium in 2002 after he first discovered Adobe Photoshop 7.0 and than, in 2004 shortly after he discovered Adobe Illustrator he decided to adopt the digital medium as a means of creative expression. His early works would have hints of inspiration by artists such as MC Escher, Victor Moscoso, Wes Wilson and Salvador Dali. In 2008 Sam took his art further and enrolled into Chester College, a private art school located outside of Manchester, NH where he would pursue his BA in Graphic Design. It is at Chester College where Sam would be exposed to the notion that art can be a professional and self-sustaining career. He would spend countless hours participating in brutal critiques and taking intensive classes in art and design history and theory in the meanwhile expanding his knowledge in the arts. Having being educated in art history Sam was able to come up with his own unique artistic style. Drawing his inspiration from ancient and contemporary culture, sacred geometry, spirituality, fantasy and nature, Sam weaves his inspirations by abstractly representing them through patterns rooted in fractal, recursive or logarithmic mathematics. Sam has the technical skill to weave several inspiring thoughts into one another so that in the end what lies before the viewer is a complex composition that resembles a dreamscape in which fantastical imagery, geometry and vivid colors are interwoven with one another. Sam launched his work publicly at his successful art opening “”Resonance”” in April of 2012. 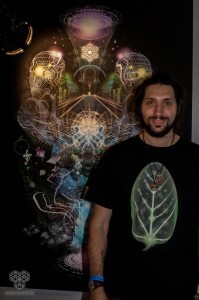 With social media and a few good contacts along the way Sam’s work went national within the month having his second show one week later at an event in San Francisco that was put on by famous artist Alex Grey. The following week his work would be shown in Los Angeles. Since than Sam has shown his work at over 9 major Music and Art Festivals from all over the country, he has done freelance design at a international level and has created his own line of clothing. At the end of October in Boston, Sam will have curated and directed his first art gallery featuring international and national artists. My intentions is to provide high quality graphic design and custom illustration to everyone involved in the network. I specialize in branding large scale events and aim to help create the vision of others.